Franschhoek is one of the most beautiful places in South Africa and certainly in the Winelands of the Western Cape. Definitely a must-see on any trip to Southern Africa, Franschhoek is a picturesque town surrounded by mountains. Home to some of the best wines South Africa have to offer, this is complemented by the award-winning restaurants that you will find everywhere. This vibrant town with its quaint little shops, street cafés and award-winning wine route will captivate you. 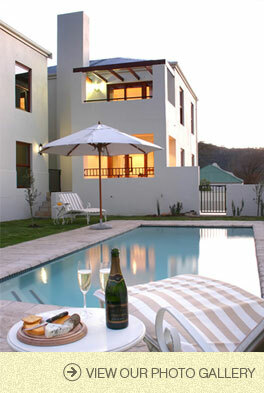 Nestled in the heart of Franschhoek, Allaire is a self-catering apartment in the prestigious Sorbonne complex. If you are looking for space, privacy and home comforts, we welcome you to open the door of Allaire for a luxurious, relaxing stay. We offer the discerning guest a two bedroom, two bathroom apartment, main en-suite. Come and have a glass of wine on the balcony whilst enjoying the stunning views of the mountains. This secure apartment on the second floor also has a lock-up garage and another secure parking place available. You are also invited to use the swimming towels provided for a swim in the complex's communal swimming pool.